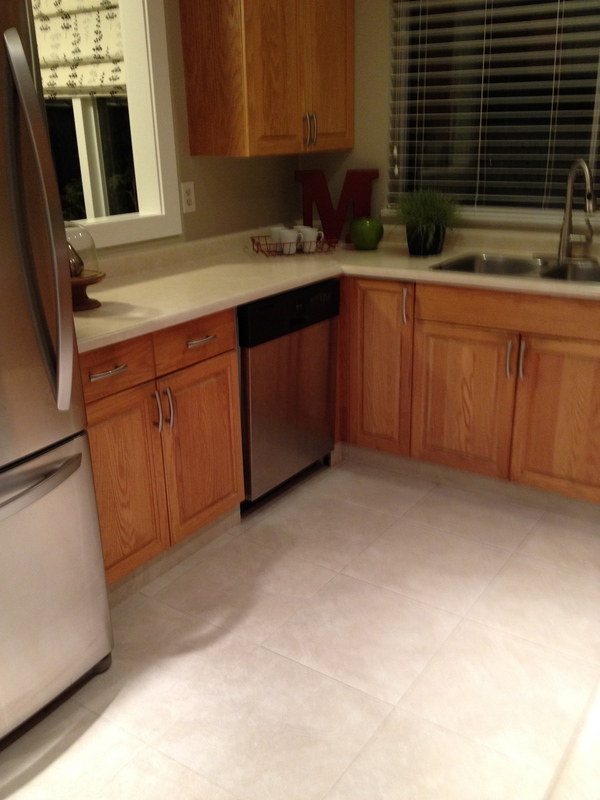 The BEFORE – Photos from the staged townhouse, our first and only visit before we put in an offer. If you haven’t heard or wouldn’t have heard, houses are flying off the market here in British Columbia, Canada. The phrase you snooze you lose is super applicable here. No inspection. Just BUY IT HUURRRY BEFORE IT’S TOO LATE OH YOU MISsed it. Fortunately, I’m pretty sure God stepped in and said “Chill. I got this” and then we did get this. Notice the slight blurriness? I knew I wanted this townhouse and I was a little frantic about it all. Not too big, not too small, but overwhelmingly oak. DISCLAIMER: I hope you will forgive me and my desire to change the oak. It’s just me and my preference. I promise I am not making any commentary on anyone who has, or loves oak. (Men mostly – I see it all the live-long day in the kitchen design biz). There is a great program offered by Home Depot called Renuit in Canada, I’m sure that there’s an equivalent everywhere now-a-days. They come look at the kitchen and or bathrooms. They remove and toss your old doors and drawer fronts. They show you door samples and a witty, charming, fantastical rep (I’m positive they ALL are these things) will tell you the cost. They can add height, pots and pan drawers, glass doors, crownmould, Islands, lazy Susan’s (or as my middle peanut used to say: Silly Sally’s) under valance lighting, soft close hinges etc., etc., etc. Et Voila! 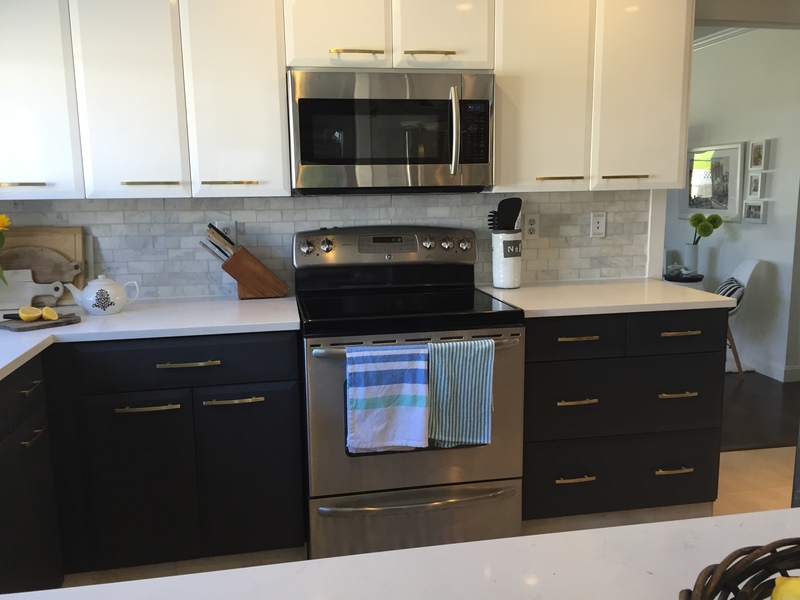 New kitchen, better meals because you want to be in that room longer, quicker clean up because you want to be in that room longer, happier family because you want to be in that room longer….ok I went too far there, but you get my drift. The best part is, it’s a third of the cost of a new kitchen AND it can be done in as quickly as a day. I am not lying. Because they are not ripping your kitchen apart and out, they just bust a move. You need to pick your own hardware, but they put them on the cabs no charge. Renuit even has a interactive website where you can see what the cabs you like look like in a kitchen. Even if you don’t live here, you can marvel at the process and then find the equivalent in your area. You may not be able to tell by the pictures, but the bottoms are a dark gray and they are beveled exactly like the uppers. On the exposed ends of both the upper cabinet run and the lower run, we added what they call plant on doors. It’s the same door as everywhere else, but without the hardware. 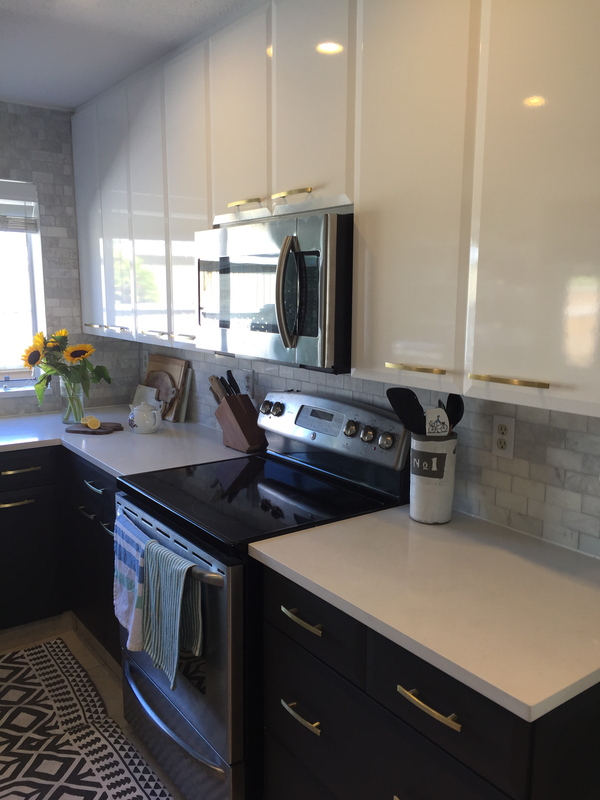 The countertop was changed from a beige laminate to a white quartz that has a little gray and taupey veining here and there. Undermount super deep rectangular sink. And we actually kept the faucet from the previous owner. You could tell they had changed it for a bit of a quick update. Hubs and I did all the tile work in here, I will go through that in another post because trust me when I tell you it was quite the adventure of it’s own. I DO hope you love it, but I’ll still like you even if you don’t. Previous Post Black walls – Trending – And I’m all IN! This is a fabulous makeover. Great choice of finishes and thank you for sharing information about the Home Depot Reunit program! Thanks for the thumbs up Concepts in Design! The makeover looks great! I’m actually hoping we can get away with changing just our cupboard and drawer fronts and facias when we get around to our kitchen (not a priority since its from the ’90s when the rest of the house is from 1970) so seeing how effective it’s been in your home is really encouraging. We will definitely investigate. I am actually trying to retain the original 1970 features of the house while updating things and making the place fresh. I used to hate 70s style but now I like it. Mid Century Modern -THE BEST! I love it! I’m not a big fan of tile, but that color is awesome! I’m longing for the day that oak leaves my kitchen. Yeah, I was not sorry to see those doors go through the house on the way out. B-bye. Now you know how you can do it too? I’m totally digging it. Didn’t know about that program, as you know we slaved over refacing our kitchen cabs ourselves. We did however put in black Quartz through Home Depot. Love them s much. We’ve been busy here, actually preparing our home for sale. Can’t blog because it’s not for public consumption yet, except for the 1,232 peeps that follow you. No house to move to yet, but like your market they go fast, and we won’t put ours up until we find one, lest we find ourselves homeless. That will never do. Anyway, like you we feel the hand of God in our conviction that it’s time to move on and leave our family home to someone who wants to grow their own. It’s been an interesting ride. I’ll blog about it. I need to blog about both kids getting married within six months of each other, and sadly that my sweet Hedy, stepmom, passed away yesterday. Oh the joy and the ache of it all. But enough about me! Pray that the exact right home will present itself to #makeuswannamove. We are ready, but is that God’s answer? Hugs and love. Wine’s on me and a great meal downtown. All you need to do is get down here! Pearly of the cricket blog. Hey, this is brilliant! 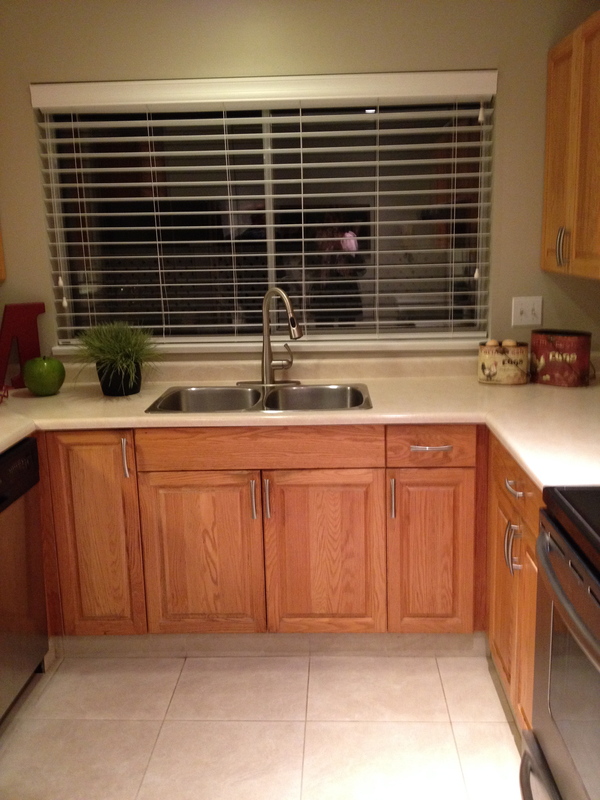 We have a similar issue with a high quality but overwhelmingly orange oak kitchen, which is also quite small. We’d love to do it up but with bathrooms still to do too, we just can’t at the moment. A lot of people have suggested just making over the doors so thanks for the proof that it works! I love the tiled hub too. Thanks Alex! We did the bathrooms as well in the white doors. I really think it’s s fab way to jazz up the kitchen but you are right, it still costs. Oh I love it! I especially love the tiles! But you didn’t really throw away the oak cabinet doors did you? Wouldn’t you be able to sell something like that? I’m pretty sure if they are in good condition they donate. He for sure is using the handles again, they were in great shape. And thanks for loving it, it means a lot! We investigated Home Depot’s service when we first bought our house and just couldn’t swing the price. 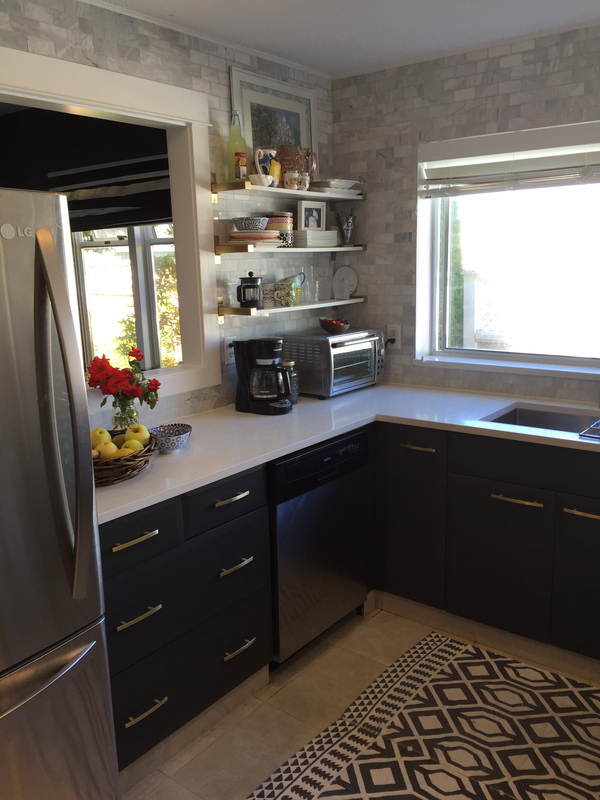 Your kitchen is gorgeous!!! I especially love that you switched the one cabinet to floating shelves. I would love to do that! Hiya, yes it’s not free for sure but it’s a third the cost of a new kitchen and we were in a good spot financially for a change. They also carry a fab kitchen can painting kit for a couple hundred, and you can paint without prep from Rustoleum if you’re willing to put in the work. I almost went that route. Good luck! Your kitchen looks amazing. What a great idea replacing doors; painting cabinets is hard. Looking forward to hearing about the tile work. Painting is super hard to do well. Spraying is best if you can. And I find it can still sometimes rub off around the handles or scratch off. I’d be miffed after all that work! looking forward to tiling post and like the tiles. Tiles from Home Depot also? Yes, the tiles are from HD. Thanks so much for commenting! Love! The shelves look wonderful and so much better than the cabinets did in that space. That tile! Love it! Thanks In Art Therapy! The shelves are great fun to change up. 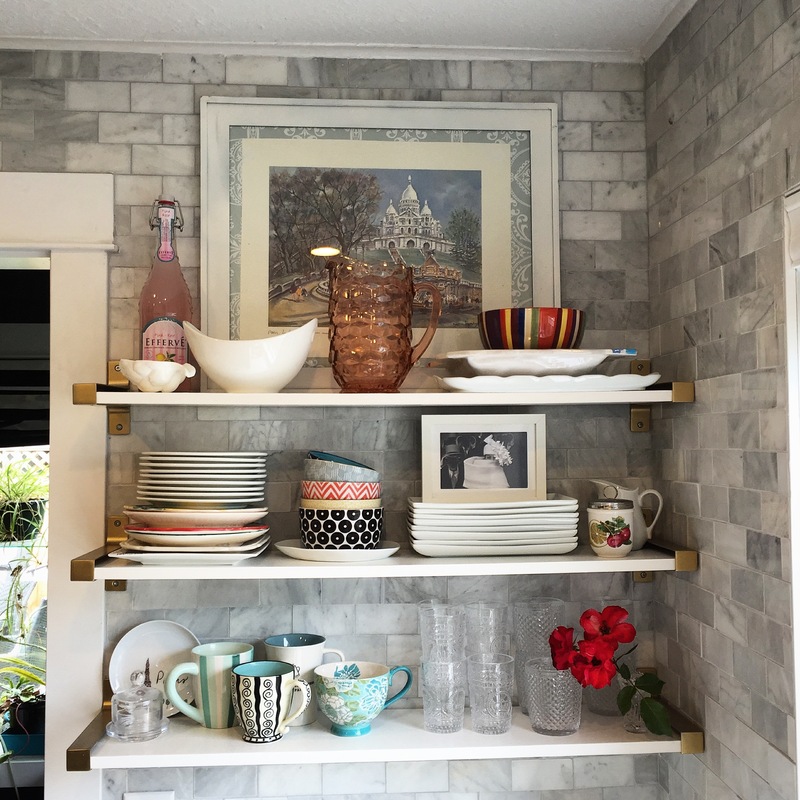 I’ve always loved the look of open shelving. Beautiful! Love the backsplash, and that you tiled all the way to the ceiling. Thank you black cat. I am happy with it all but please please don’t ask me to tile anything ever again! Oh so lovely and I “love” it. Wow. I had no idea that the cabinet switch out could be so slick. I spent a small fortune on white paint to cover up oak cabinets and finally went with simple white cabinets from IKEA. Fabulous choice with the gold handles. The counters and the tiling- gorgeous. I’m now wishing I had stretched myself beyond the timeless”black and white” look. Your kitchen is lovely (“love” the picture on the shelf) and I wish I had your “style.” You never disappoint. Oooh yes, those are especially bad. At the very least you can paint oak. Those others are just evil, lol. Thanks for the comment! I N C R E D I B L E ! ! ! You have such an amazing gifted eye for design my friend! Your kitchen looks so beautiful and high end! I’m drooling over every detail especially that tile backsplash! W O W ! Now pretty, pretty please come do mine!